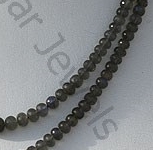 Shapes make gemstone look more attractive. 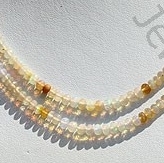 It is the reason jewellery designers are working constantly to come up with unique and striking silhouette. 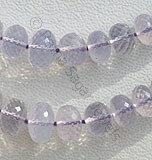 One such form that has caught the fascination of gem lover is Faceted Rondelles. 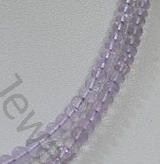 Faceted Rondelle has been the most amazing shape and it has won the hearts of people with its smoothness and perfection. 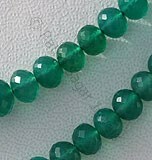 Rata Sagar Jewels offers you Green Onyx beads that are faceted Rondelles. 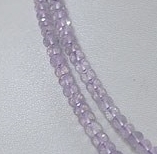 All the gems in the strand show symmetrical rondelle shape. 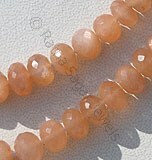 Wear the soothing stone is stylish shape and keep away stress & worries. 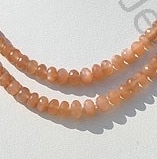 Browse through our site to see Faceted Rondelle shape in a variety of gemstones like: Labradorite, Green Onyx, Pink Spinel and Orange Moonstone. 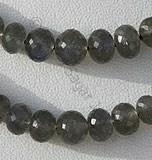 The faceted Rondelle shape is indeed a treat for all those who love to adorn themselves with the best shapes of gemstone beads. Ethiopian Welo Opal is variety of mineraloid, possess property of transparent, with sub vitreous to waxy luster and are available in multi-colored with fire in micro cut, Rondelle Shape. 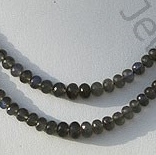 Labradorite gemstone is the most beautiful iridescent play of colours, possess property of semi-transparent with vitreous to pearly luster and are available in black color with peacock blue flashes in micro cut, Rondelle shape. 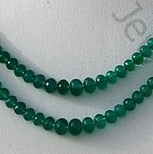 Green Onyx Gemstone is a variety of natural white chalcedony quartz, which is treated with deep green color, possess property of translucent with vitreous luster and are available in green color with micro cut, Rondelle Shape. 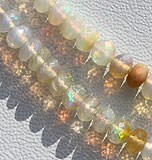 Natural Orange Moonstone possess property of transparent and are available in Orange Color with silky sheen with micro Cut, Rondelle shape. 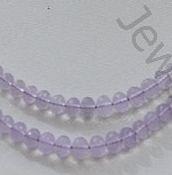 Lavender Quartz Gemstone is a variety of natural quartz, possess property of transparent and are available in soft pinkish-lavender color with micro cut, Rondelle Shape.